This book is a collection of essays of roughly the same length, penned by some of the most prominent authors in Ufology today. Each author considers an aspect of the UFO mystery that touches upon their own specialised area of research. As a result, the books provides a diverse selection of viewpoints, ideas and expert opinion spanning the entire subject. Most. perhaps all, of the authors (Michael Pye (Editor), Kirsten Dalley (Editor), Stanton T. Friedman, Erich von Daniken, Nick Pope, Marie D. Jones & Larry Flaxman, Thomas J. Carey, Donald R. Schmitt, Kathleen Marden, Nick Redfern, John White, Jim Moroney, Gordon Chism & Micah Hanks) have written books published by New Page, many of which I have reviewed for this website in the past few years. As such, I found myself quite familiar with the content of many of their essays - in several instances the essay in this collection was essentially a boiled down version of one of their books. This book is thus a compilation of work which provides an excellent opportunity to discover the research and writing style of these fine authors. The Roswell Incident is fairly well covered in the book, with a further two articles by leading researchers Thomas J. Carey and Donald Schmitt. Secrecy can be kept by governments, Friedman notes in the first of his two essays; a thought later qualified by ex-MoD UFO researcher Nick Pope in his review of the recent releases of British UFO files. In a book otherwise devoid of a sceptical voice, Pope comes closest to casting doubt upon government cover-up conspiracy theories. UFO sightings are up, it appears, despite the fact that those reporting such events risk a decline in their social status as a result, notes George Chism. He describes his own exciting UFO encounter in vivid detail, an event which kick-started a lifelong interest in the subject. Likewise, Jim Moroney's fantastic out-of-this-world experience. Kathleen Marden takes up the abduction theme, covering a lot of ground in her allotted space. Her academic style provides the reader with history, case studies, a look at academic work into this most controversial of subjects, and an overview. A more journalistic approach is provided by Micah Hanks, in what I consider to be the best essay in this collection. He takes up the subject of UFOs and nukes, an area pioneered by author Robert Hastings. In a fast-moving article that quickly gets the book's pulse racing, Hanks describes the amazing capabilities of UFOs observed by military men in the (supposedly) most securest of settings. 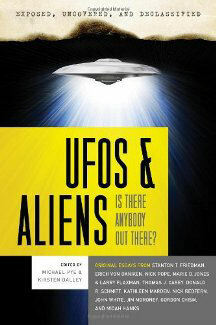 Two later essays delve into what UFOS actually might be, and shift the book's focus away from the Extraterrestrial Hypothesis more strongly favoured early on. John White offers a multifaceted solution to the enigma, with a thought-provoking dip into the subject of 'metaterrestrials'. Similarly, Marie D. Jones & Larry Flaxman provide another of their insightful overviews, examining several tangential arguments of some relevance; like djinn, time travelling, altered states of consciousness, and other paranormal phenomena which dovetail into the UFO topic. Finally, Erich von Daniken does a little time travelling of his own as he takes the reader back to a time when aliens may have visited, even moulded, early civilisations. Genetic manipulation may have been as relevant then as they are now, argues the famous ancient astronaut theorist. There are a few pitfalls in assembling together a coterie of UFO writers in this way. Kenneth Arnold is mentioned too often, for instance - he provides the essential grounding material for the origin of the subject. The Roswell material is repeated in places - inevitable when three leading Roswell researchers are covering the subject individually. But perhaps this would not be such a problem for a reader new to the subject, or one needing to tap into the subject with just one book (a journalist needing to write a UFO piece might find this book very useful, for instance). Subtitled "Is There Anyone Out There?"